Our clinically therapeutic and luxurious massage and spa treatments include Therapeutic body-work, Traditional and Eastern massage therapies, Orthopedic Massage/Integrative Body Work, world massage therapies, body detoxifying treatments, energy work and tropical escapes. Also, be sure to check out our massage packages and other helpful information. Experience the pure bliss of a unique full body massage using moderate pressure to create deep relaxation, healing and therapeutic results. Very similar to our popular Signature Massage but without the heated gel packs and for 50 and 80 minutes in duration. We know you will love this massage so we created The Bliss Club to make it affordable to take care of yourself with regular massages. Join the Bliss Club for only $59 per month or double your bliss for only $110 for 2 massages per month. You can also opt to purchase a customized essential oil formula to extend the serenity! We use only organic and pure grade essential oils. Delight in the relaxing and mood lifting benefits of an aromatherapy massage designed to arrest stress and create a state of serenity. Light pressure will be used to create a tranquil and relaxed state of mind, body and spirit. Aromatherapy can be customized to lift mood, reduce stress, provide deep relaxation, create overall well-being. Join the Serenity Club and receive your massage for only $59 per month or double your serenity and receive 2 massages for only $110 per month. You can also opt to purchase a customized essential oil formula to extend the serenity! We use only organic and pure grade essential oils. Let our gifted therapists design a unique full body massage to suit your personal needs and preferences. This massage combines a variety of eclectic techniques to achieve deep relaxation, healing and therapeutic results. Gel heat packs and customized aromatherapy are offered to provide a sense of comfort and well-being. “Stone Therapy Massage” uses the application of heated stones and calming essential oils to achieve a deep penetrating massage. Hot stone massage brings about balance and harmony in conjunction with your body’s natural healing energies. It can be a relaxing, meditative treatment, as well as a detoxifying treatment. A therapeutic technique that relieves chronic tension and pain through slow, deep-targeted pressure and strokes. Focus is on specific problem areas that need extra attention. Orthopedic Massage uses current scientific research combined with techniques designed to address various pain conditions and structural imbalances. Orthopedic Massage Therapy is a multidisciplinary approach to relieving muscular and soft tissue pain, dysfunction, and injuries. It is also utilized to help clients regain and improve their health and fitness level. It is not only beneficial for professional athletes and “everyday athletes;” but also for those with injuries or those who are seeking greater mobility and range of motion. Ongoing clinical assessment and treatment is a regular part of this unique modality. Clients are dressed in sports attire; while individualized techniques are designed to ensure minimal to no pain. Orthopedic massage identifies and addresses root cause of issues. Each month our gifted therapists create the perfect massage or body treatment to accompany the changes in weather and to emphasize the gifts and the healing power of the seasonal changes from our Toasted Coconut Passion Fruit Infusion Massage to our Heavenly Holiday Meltdown each month brings a new reason to celebrate and enjoy the benefits of massage all year long. See our monthly specials or visit 12 months of Spa to see the monthly treatment. SAVE when purchasing the 12 months of Spa year-long package. Relax, breathe deep and feel alive again! This lavender treatment includes a hand and foot heat wrap, with lavender shea butter, along with warm body oil to de-stress, re-store and rejuvenate. Sink into warm lavender neck and body heat packs while you are drenched in warm lavender body oil for a deeply relaxing full body massage. Did you know? One hour of massage is equal to 7 hours of sleep! There is nothing better to reduce stress than a regular massage. Reflexology is an Oriental healing technique that promotes balance, facilitates stress reduction and increases energy levels through the specific reflex of pressure points on the feet and ankles. Exfoliation of the feet and lower legs is followed by pressure point massage to the feet, producing balance, harmony and relief from tension and stress. 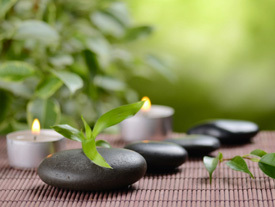 This new and innovative style of massage therapy and body work is based on ancient principles. This massage gives you the deepest pressure possible to remove knots and tension. Unlike anything you have experienced. Minimal discomfort and it will lift your spirits for days. Experience the ultimate in unified body and mind. The Access Bars® are 32 bars of energy that run through and around your head that connect to different aspects of your life. These bars store the electromagnetic component of all the thoughts, ideas, attitudes, decisions and beliefs that you have ever had about anything. Touch one Bar and you begin to clear away the energy locked up in that area or aspect of your life just by touching it. Having your Bars run is like defragging your brain – freeing up space to create and see the world with new perspective. Indian Head Massage begins with a custom selection of pure essential oils, diluted in jojoba for the perfect massage to support your health and provide the powerful healing benefits of aromatherapy. Gentle massage of the upper back/shoulders/neck, is followed by unique invigorating scalp massage techniques, and then finishes with the most nurturing face massage you’ve ever experienced. Indian head Massage has quickly become a Fan favorite. Enjoy by itself or combine with Serenity Massage or any treatment for the perfect combo. Reiki comes from the Japanese word (Rei) which means “Universal Life” and (Ki) which means “Energy”. The practice of reiki is based on an Eastern belief that we can support the body’s natural healing abilities and processes. While reiki has been applied to a variety of conditions, including stress, pain, anxiety, fatigue, and depression, it may have its greatest potential in assisting individuals to unlock their own innate wisdom and inner light. Often layers of worry, fear, anger, attachments and modern stress keep us from expressing our true nature of health, happiness and wholeness. According to Reiki Master Frans Stein, “The system of reiki refers to five very specific elements; precepts, meditations, hands on healing, symbols/mantras and the attunement/reiju. These elements help the practitioner to slowly remove the layers so that our innate health & brightness can shine in all its beauty once more. With our new Couple’s Massage, you can treat yourself and a loved one, friend, or family member to a luxurious treatment. Choose between a 60 minute full body massage, or a 90 minute treatment which includes an invigorating foot scrub, rich body butter, and a 60 minute full body massage! $200 for 6 treatments (single treatment price is $40; follow-up treatment after introductory package is $35) The Aqua Detox foot-bath system is the fastest and most effective way to re-balance, re-energize, and detoxify the body. Research has shown that those receiving the treatment have had increased vitality, circulation, energy levels and a greater sense of well-being. We recommend six treatments in the first month and a follow-up of one to two maintenance treatments per month thereafter. The Aqua Detox package must be used within eight weeks of the original purchase date. Fall into the most peaceful state of deep relaxation with an all-natural approach to support relief from sinus pressure, headaches, migraines and respiratory conditions. Warm eucalyptus heat packs hug your neck reducing inflammation and easing stress. Soothing eucalyptus eye covers, ease away tension. Breathe in the scent of this healing herb as you receive a 75 minute therapeutic massage. Wake up your tired feet with a boost of cell-stimulating, caffeine-rich organic green coffee and yerba mate, plus a sunburst of orange. This treatment begins with a steaming hot foot soak, followed by a green coffee yerba mate foot scrub and ends with a relaxing ylang ylang tea foot massage. It’s pure heaven! Let your feet delight in this customized foot treatment using a blend of professionally combined essential oils perfect for your needs, combined with a Himalayan salt scrub, a mud-clay mask and a made to order body butter to massage your feet to a blissful state. Indigenous healing herbs are combined with Eastern massage techniques to open the flow of energy in the body, releasing blocks of energy where pain and discomfort are built up. This body wrap focuses on detoxifying the body using dry brush exfoliation to circulate blood and lymph flow. An organic herbal poultice compression containing healing herbs is used to draw out toxins. A comforting massage is given with Turquoise and Sage body lotion, in combination with the essential oils of sage, lavender, chamomile, and green tea. While in a deeply relaxing cocoon wrap, enjoy a mini facial exfoliation and moisturizer for a perfect conclusion to this amazing treatment. The unique Pure Fiji spa rituals reflect the beauty, ancient spirit and Island traditions of Fiji where beauty is felt, individual traditions are respected and spirit is honored. The exotic treatments of Pure Fiji are designed to utilize the islands’ natural resources, embracing the gifts of nature and the uniqueness of Island Life, celebrating the youth and beauty that lives within us and the call to embrace the sun, the ocean and the healing and restorative power of nature. Choose from Paradise Pedicure Rituals, Coconut Scalp and Hair Treatments, Sugar Glow Massages and Tropical Body Wraps. Pure Fiji’s unique blend of cold pressed nut oils infused with tropical flowers will rejuvenate, replenish, hydrate and nourish your skin. Choose from pure virgin coconut oil fragrances including orange blossom, mango, star fruit, pineapple, white ginger lily, pure coconut and more. Your skin will feel like you are living in paradise. Enjoy a head, neck and scalp massage with the added benefit of warm coconut oil. Release stress and improve scalp circulation while deeply conditioning your hair. Step into paradise with a coconut milk and honey foot soak and pineapple coconut sugar foot scrub followed by exotic body lotion and Shea butter. Your tropical island vacation continues with our full body Signature Massage using heated gel packs and luxurious customized island essential oils such as coconut, mango, orange or pineapple massage oils. Be enveloped in the fragrant notes of the tropics as you escape to Paradise! Book your own mini-vacation every month of the year! Save $450 when you purchase the 12 Months of Spa. It’s like getting more than three, 90 minute Body Treatments… FREE! Click here for a complete list of the 12 months of Spa treatments. We’ve made it super easy to finally put yourself on your own calendar. Sign up now for our new Bliss Massage club. For just $59 a month you can experience our premier relaxation massage every month: pure bliss! Even better: sign up for 2 bliss massages each month for only $115! Enjoy all the benefits of our Serenity Massage at a special discounted rate. Purchase five Serenity Massages and get the sixth massage free, as our gift to you. The Serenity Package must be used within four months of the original purchase date. Enjoy all the benefits of our Signature Massage at a special discounted rate. Purchase five Signature Massages and get the sixth massage free, as our gift to you. The Signature Package must be used within four months of the original purchase date. Each month our gifted therapists create the perfect massage or body treatment to accompany the changes in weather and to emphasize the gifts and the healing power of the seasonal changes from our Chocolate Covered Strawberry Caramel Massage to our Bahama Mama Escape, each month brings a new reason to celebrate and enjoy the benefits of massage all year long. See our monthly specials. Unlike anything you have ever experienced. Now available in a 60 minute or 90 minute package! For the 60 minute package, purchase 5 and get the 6th Free! For the 90 minutes package, purchase 5 and get the 6th Free. The Bamboo Package must be used within four months of the original purchase date. Benefit by the on-going therapeutic value of Orthopedic massage & Body work. Purchase 5 and get the 6th Free. Package must be used within four months of the original purchase date. Ongoing clinical assessment and treatment is a regular part of this unique modality. We’d like to thank you for choosing The Family Wellness Center to meet all your therapeutic massage and day spa needs. For each new client you refer to our center, you will receive $10 off your next service. Refer two new clients, receive $20; refer three new clients, receive $30, and so on! You will be given your thank-you certificate after your referral has received his or her first massage or day spa treatment. We look forward to serving you and your loved ones for many years to come! ARRIVAL & CHECK IN – New Clients should arrive 15 minutes prior to their scheduled time to allow sufficient time to complete client profile information. Repeat Clients should arrive 5-10 minutes early to relax and prepare for your service. CANCELLATION POLICY – Because your services are reserved for you, we ask that you give a minimum of 24 hours’ notice for all cancellations. Any notice given at less than 24 hours will be charged at 50%. Appointments cannot be guaranteed for late arrivals. To be fair to all our guests and massage therapists, late arrivals may not receive a full service and will be charged for the full service. Arriving early will allow you to enjoy every minutes of your experience!